Interim Man Utd boss Ole Gunnar Solskjaer has shared some words of wisdom for former teammate Paul Scholes. As noted by BBC Sport, the 44-year-old has taken charge of League Two outfit Oldham, as he embarks on a career in management having previously worked as a pundit. 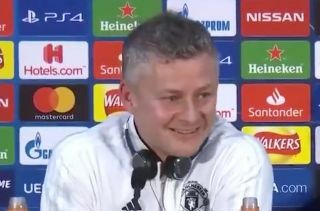 Solsjkaer returned to England to replace Jose Mourinho on an interim basis at United until the end of the season, but having led his side on an 11-game unbeaten run, he has shown that he is more than capable of taking on such a big role. With that success in mind, the Norwegian tactician was asked if he had any advice for Scholes on Monday, and while there were some wise words shared, he couldn’t help but have a dig with a warning too over pundits. Scholes rarely held back during his role on BT Sport in particular, as he was often highly critical of what he was seeing at Old Trafford under Jose Mourinho. Now, he will come under scrutiny himself if he doesn’t get positive results at Oldham, and so time will tell whether or not it’s the start of a promising managerial career or a harsh lesson for the United legend in a new field of work.